Looking for recipes to help make weeknight meals easier? Chef Ryan Scott's first cookbook, One to Five: One Shortcut Recipe Transformed into Five Easy Dishes, is where you will find them! The book features more than 100 easy-to-make recipes from the Emmy-Award winning food host. “When it comes to cooking at home, if I can’t prep it, cook it, and sit down to eat it in an hour or less, I don’t want to do it. It’s just that simple,” says Chef Scott. In his cookbook, Chef Scott demonstrates how to think creatively in the kitchen. Readers master one basic recipe and learn how to spin it into five quick, affordable meals. Take for example his Marinated and Roasted Portobellos, start with this "one" recipe and make the following: Mozzarella-Stuffed Crispy Portobello Burgers, Portobello Ranch Fries, Bello Ghanoush, Portobello-Olive Mayo. Chef Ryan is actually one of the first chefs in the country to have a full kitchen of BlueStar chef inspired appliances. I have to admit I am extremely jealous, I would do anything to have a BlueStar range like his!! You can check out his BlueStar kitchen and cooking videos here. Whisk together the onion, olive oil, wine, red wine vinegar, soy sauce, balsamic vinegar, lemon juice, and garlic paste in a 13-x-9-inch baking dish or roasting pan. Add the mushrooms to the marinade, turning them to coat both sides. Cover and chill for 1 to 3 hours. Preheat the oven to 400°F. Put the mushroom caps, gill sides up, on an aluminum foil-lined baking sheet, and bake until tender, about 20 minutes. Sprinkle with salt and pepper. I am drooling over these mushroom caps! Sounds like a wonderful cookbook! 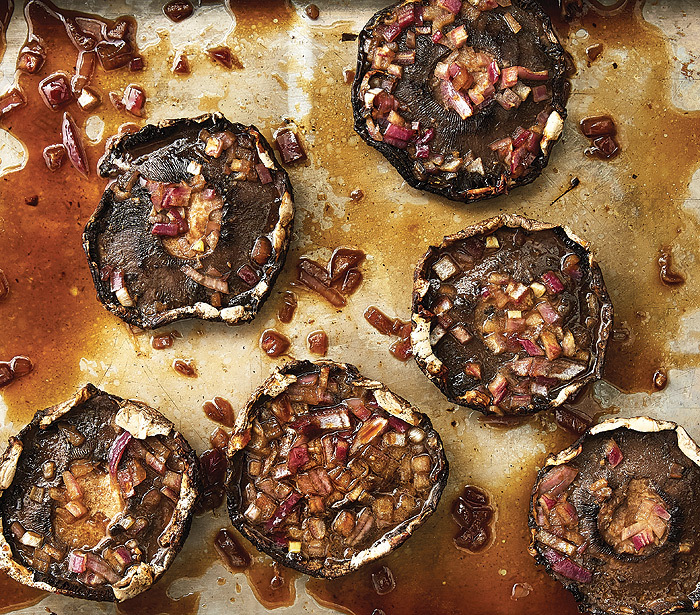 Balsamic goes so well with mushrooms. These look ah-mazing! Going to check out the cookbook now! I'm such a mushroom fan - these sound so flavorful!! This definitely made my mouth water! Looking up that cook book right now! I have this book and Chef Ryan's concept of One to Five is awesome! I love mushrooms and this recipe looks delicious! Those sound amazing. I wish I weren't allergic to mushrooms! They're so tasty! Those mushrooms look amazing! I could live off those for days! Looks and sounds fabulous! YUM! Man, I adore mushrooms. And that dish looks Ah-Mazing! YUM! Love making Portobellos! yum!! These look perfect! I need this cookbook because these look fantastic! I love the sweet acidity balsamic adds to things, bet these are so delicious! Fabulous recipe and if it's an example of more in the cookbook, I'm in!